Explain types of sewers and sewer appurtenances? Question: Explain types of sewers and sewer appurtenances? Asbestos Cement (AC) Sewers are manufactured from a mixture of cement and asbestos fibre. Asbestos Cement (AC) Sewers are suitable for carrying domestic sanitary sewage. 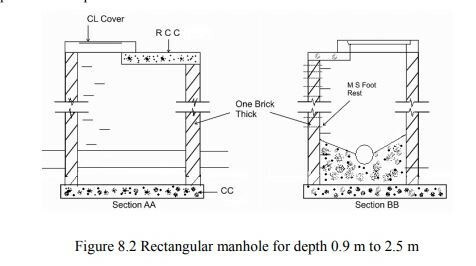 Asbestos cement sewer is best as vertical pipe for carrying sullage from upper floors of multi-storey buildings (in two pipe system of plumbing). Brick Sewers are made at site and used for construction large size sewer. Brick Sewers are very useful for construction of storm sewer or combined sewer. Nowadays brick sewers are replaced by concrete sewer. Brick sewers my get deformed and leakage may take place. A lot of labour work is required. i. PCC – for dia up to 60 cm Suitable for small storm drains. Not durable. ii. RCC – for dia > 60 cm They may be cast in situ or precast, resistant to heavy loads, corrosion and high pressure. These are very heavy and difficult to transport. These types of sewer are High strength and durability water tight. Cast Iron sewers can withstand high internal pressure and can bear external load. Cast Iron sewers are suitable for the following conditions. Nowadays PVC sewers are used for carrying sewage. Plastic sewers are resistant to corrosion. Such types of sewer are light in weight, smooth and can be bent easily. But Plastic sewers are having high co-efficient of thermal expansion and cannot be used in very hot areas. • A manhole, also known as an inspection chamber, provides access to underground utilities, most commonly sewer systems. This enables operatives to undertake inspections, make modifications, and carry out cleaning and maintenance. • Manholes are generally constructed where there is a change of direction and/or a change in gradient of the utilities, or where access is required for a specific maintenance purpose. They are typically positioned 0.5 m away from curb lines, preferably with the manhole cover positioned away from the wheel line of traffic. • The cover acts as a plug to protect the manhole and prevent unauthorised access. Covers can be circular, rectangular or square, and are typically made from metal or, less commonly, precast concrete, glass reinforced plastic, or a composite material. An inverted siphon or depressed sewer is a sewer that runs full under gravity flow at a pressure above atmosphere in the sewer. Inverted siphons are used to pass under obstacles such as buried pipes, subways, etc. This terminology ‘siphon’ is misnomer as there is no siphon action in the depressed sewer. As the inverted siphon requires considerable attention for maintenance, it should be used only where other means of passing an obstacle in line of the sewer are impracticable. It’s a pipe connected to the underground sewer the other end of the clean out pipe is brought up to ground level and cover is placed at ground level. A clean out is generally provided at the upper end of lateral sewer in places of manholes. During blockage of pipe the cover is taken out and water is forced through the clean out pipe to lateral sewer to remove obstacle in the sewer. 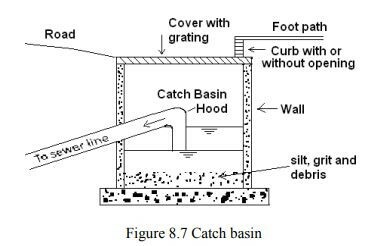 Catch basins are provided to stop the entry of heavy debris present in the storm water into the sewers. However, their use is discouraged because of the nuisance due to mosquito breeding apart from posing substantial maintenance problems. At the bottom of the basin space is provided for the accumulation of impurities. Perforated cover is provided at the top of the basin to admit rain water into the basin. A hood is provided to prevent escape of sewer gas.